There are multiple of Emily Stites from the world xc champs which you can find here, here, here, here and here. Dan Stimson, former director of the track team and now assistant coach was featured in the Flat Hat, which you can see here. William and Mary All-American Elaina Balouris (Allison Park, Pa.) opened the spring season last weekend with one of the nation's fastest times at 3,000m, and was rewarded for her efforts Tuesday with selection as the Colonial Athletic Association Track Athlete of the Week. This is the eighth weekly honor of Balouris' career. At the Tribe Invitational on Saturday, the junior math major opened the day by finishing second behind teammate Katie Buenaga (Greenville, Del.) in the 1,500m run, finishing with a time of 4:34.65. At the end of the day, she came back and won the 3,000m convincingly, running 9:37.79 to qualify for the ECAC Championships. It is the fifth-fastest time in the nation so far this spring. The William and Mary men's track and field team took home both weekly honors from the Colonial Athletic Association on Tuesday, as Rad Gunzenhauser (Pittsburgh, Pa.) and Austin Vegas(Kernersville, N.C.) were honored for their exploits last weekend. This is the second weekly award for Gunzenhauser, and the first of Vegas' young career. Gunzenhauser was named Track Athlete of the Week after he won the 10,000m at the Tribe Invitational on Friday night with a nation-leading time of 29:50.06. His performance, in addition to being a lifetime-best by more than minute, qualifies the junior for the IC4A Championships. Gunzenhauser now ranks 13th all-time at W&M in the long-distance event. Vegas was a co-winner of the Field Athlete of the Week award after opening his spring with an IC4A-qualifying jump of 4.80 meters (15-9) in the pole vault. Vegas, who was declared the winner of the event on criteria over classmate Greg Gallagher (Elmsford, N.Y.), also had three solid attempts at a Tribe freshman-record of 4.91m (16-1). Vegas is tied for seventh all-time at W&M outdoors in the pole vault (alongside Gallagher). 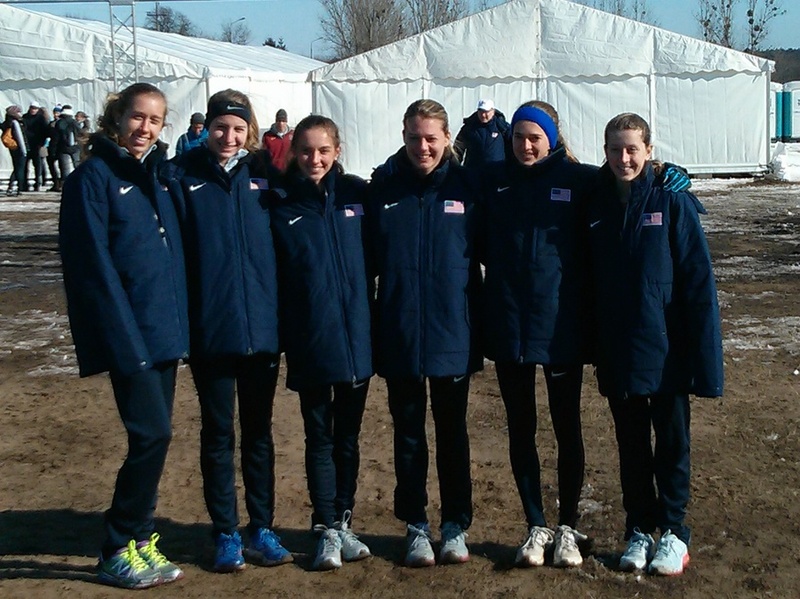 Here is a video recap of the junior women's race from the World XC race. 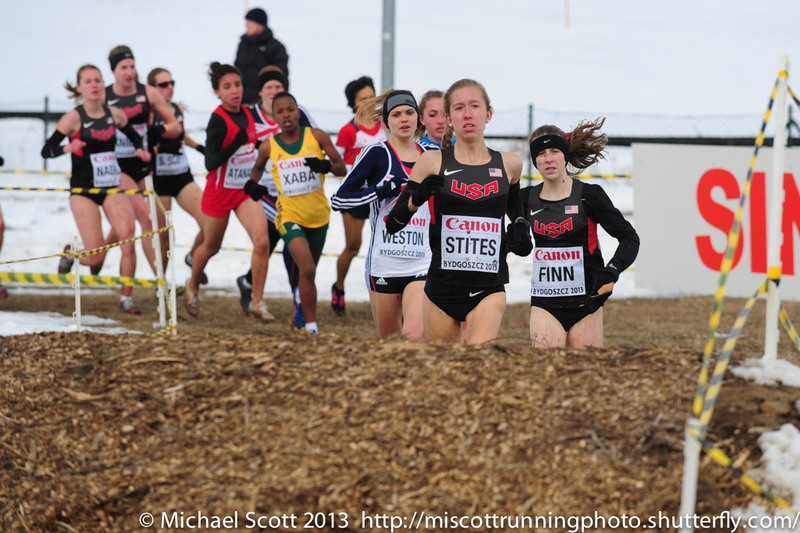 Frosh Emily Stites continues to absolutely shine with a 23rd finish at the World XC championships. She was the second woman (after winning the trials for the US) for the US in a time of 19:37 following the winner's time of 17:57 (bottom of the first page). The USA Junior women finished 6th overall. Here is Emily Stites (on left in picture) in Poland the day before the World XC Champs. On Friday March 1st the IC4A and ECAC Qualifiers departed for Boston to prepare for competition on Saturday and Sunday. On Saturday at the IC4A Championships, W&M walked away with its second-consecutive 5,000m title. Junior Rad Gunzenhauser ran a lifetime-best 14:05.95 to win his first IC4A title. This time improves Rad to eighth on the all-time athletes list. It was his first conference title of any sort, bettering his runner-up showing at the CAA 10,000m last May. Freshman Bob Smutsky also competed on Saturday, in the 200m prelims. His time of 22.32 was not fast enough to advance, but it did tie for the seventh-fastest time ever recorded by a Tribe sprinter indoors. On Sunday, senior Alex McGrath ran a lifetime-best 8:05.72 in the 3,000m run, finishing in fourth to add yet another All-East honor to his career. Alex's time ranks him fourth in school history behind only All-Americans Matt Lane '01, Ken Halla '86, and Brian Hyde '96. The men’s team finished the meet with 15 points and in 22nd place out of 44 scoring teams. Leading the way on Saturday at the ECAC Championships was sophomore Dylan Hassett in the 5,000m run. Dylan earned her first All-East accolades with a lifetime-best performance of 16:41.42. This performance improves Dylan to 10th in school history in the event. Freshman Claire Tito broke her own freshman record in the 500m dash with a time of 1:15.29. This race moves Claire up the board to stand fifth all-time at W&M. In the 1,000m run, senior Katie Buenaga took 10th in the prelims with a time of 2:53.18. After getting boxed in multiple times, her time is still the 11th-fastest at W&M. In the pole vault, sophomore Elizabeth Crafford tied for 13th overall at a height of 3.65 meters (11-11.75). Junior Nicole Dory tied for 16th place, clearing the bar at 3.55m (11-7.75). In the 3,000m, junior All-American Elaina Balouris claimed All-East honors for the fourth time, running 9:42.18 for fourth place. 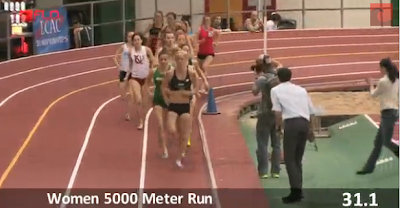 Sophomore Dylan Hassett doubled back and was right behind her for fifth in 9:42.41, improving to 12th in school history. It was the second All-East honor and second lifetime-best performance in less than 24 hours for Dylan, who was also sixth in the 5,000m the night before. Freshman Meghan McGovern was 12th overall, just a few seconds behind her own best to finish in 9:47.18. Running in the slow section of the distance medley relay, our women put up a good fight and just barely got edged out for the win from the fast section. The DMR took second overall with the second-fastest time in school history, 11:39.83. Senior Katie Buenaga led the way on the 1200m (3:31) leg before passing to sophomore Maggie Gutierrez to run the 400m (60.0), freshman Claire Tito to run the 800m (2:16), and senior Michelle Britto to anchor on the mile (4:52) in turn. The 4x800m relay qualified for Sunday's finals in 9:09.67, the eighth-fastest time in school history and the best performance since 2009. The qualifying team included sophomores Heather Clagett (2:16), Casey Lardner (2:16) and Maggie Gutierrez (2:17) before junior Olivia Harding (2:20) brought the baton home on the anchor. On Day two the 4x800m relay came back to run 9:01.19 run was good for sixth place overall. It was also the fourth-fastest time ever run by W&M, and the fastest since the school-record was set back in 1999. Once again it was the senior duo of Buenaga (2:15) and Britto (2:13) powering the win, running the third and fourth legs behind sophomores Heather Clagett (2:17) and Casey Lardner (2:14). The women’s team finished 10th out of 53 teams, its first top-10 finish since 2010 and third of the past six years. The team now has three weeks off, before opening the outdoor season by hosting the Tribe Open. We will welcome teams from up and down the east coast to Williamsburg on Friday and Saturday, March 22-23. Expect this year’s meet to be much larger than the past and opening up on Friday night with the Men’s and Women’s 10k as well as the Men’s Hammer Throw. As the U.S. junior national champion in cross country. Emily Stites will depart for Poland in a little over one week where she will represent Team USA at the World Cross Country Championships. The race will take place on March 24th in Bydgoszcz. We will keep you updated from abroad as best as possible! Emily Stites is not the only one sizzling this weekend as Rad Gunzenhauser won the IC4A 5K in 14:05 moving him to eighth on the all-time list. In the 5,000m Dylan Hassett won her first All-East accolades with a lifetime-best performance of 16:41.42. It was the 16th-fastest race ever run at W&M, and improves Hassett to 10th in school history in the event. Here is Stites' amazing 16:05 race. Just a few minutes ago, Frosh Emily Stites ran 16:05 in the 5K which is the second fastest 5K every run by a W&M runner.